I don’t normally write about bar food because, well ... it’s bar food. Sure, there are bars with great food—the bars at places like Bambara, Ruth’s Chris, Wild Grape Bistro, Tuscany and a few others come to mind. But, those are all attached to restaurants; they are not bars first and foremost. Well, a recent addition to the local bar scene happens to be a great addition to the dining scene, as well. It turns out you can have your flourless chocolate torte and eat it, too. From Copper Onion owners Ryan and Colleen Lowder comes Copper Common, located just a few steps down from The Copper Onion, in the space where Plum Alley used to be. What happened to Plum Alley, you ask? This requires a bit of backstory. Following the success of Copper Onion, the Lowders had planned to open a bar on the corner. They wanted it to be a “real” bar—one with a terrific selection of whiskeys, bourbons and such. However, at the time there were no full bar liquor licenses to be had. So, they went to Plan B and opened the pan-Asian restaurant Plum Alley. When a license finally became available, the Lowders decided to close Plum Alley and open their dream bar, Copper Common. So, Plum Alley is closed, but only temporarily. The plan is to reopen the restaurant in a new location, still to be determined. There isn’t so much as a shred of chopstick left over from the Plum Alley décor at Copper Common. The space has been completely overhauled, right down to the flooring. According to Ryan Lowder, the Copper Common look and lighting is an homage to Thomas Edison; the bar is adjacent to Edison Street. So, the place has a nostalgic feel about it. What sets Copper Common apart from most bars is that it offers the best of two worlds: It’s a full-on, no-nonsense bar, for sure. But, it’s also a bar with a full restaurant menu—and I’m not just talking nachos and chicken wings. Keep in mind that The Copper Onion is just a few doors down, so Copper Common isn’t going to dish up mediocre bar fare. There is something for everybody, from bar snacks like housemade pickles and smoked pork rillettes to mid-size plates of pastas, salads and such, plus large entree-type dishes like steamed cod with dashi, steak frites and more. 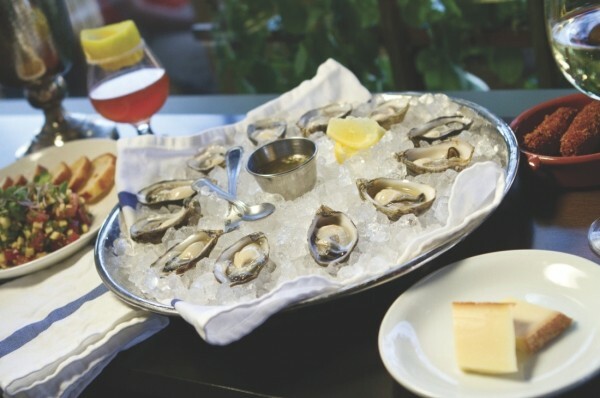 There’s also a small cold raw seafood selection, and an interesting cheese and chocolate pairing menu, wherein various cheeses and chocolates are paired not with wine, but with liqueurs and spirits. Keep in mind, though, that you don’t have to eat anything at Copper Common if you’d rather not, because it’s a bar. If you do decide to indulge, you might begin with a nutty Swiss cheese called Appenzeller, paired with Zirbenz Austrian Stone Pine Liqueur. Or maybe end a meal with Guido Gambino Italian hazelnut chocolate and Ron Zacapa 23-year Guatemalan Solera rum—there’s something you probably won’t find at your typical neighborhood watering hole. Lest this all sound a little too chi-chi, rest assured you can get Pabst Blue Ribbon, as well. Oh, and deviled eggs ($4). These aren’t your grandma’s deviled eggs, however. The two hard-cooked eggs with airy, cloud-like yolks whipped with creme fraiche and mayo are sprinkled with a smidgeon of smoked paprika and minced chives. Another can’t-miss snack or starter is the fresh-shucked oysters on the half shell (6/$18 or 12/$32), which are half-price until 6 p.m.
Four bucks for a couple deviled eggs seems a tad steep to me, but I can’t complain about the very generous serving of tuna tartare ($12) at Copper Common, which my wife and I couldn’t even finish. It must have been nearly a third-pound of sushi-grade tuna, diced along with gala apples, radish and ginger, tossed in a slightly sweet sesame dressing. The tartare comes with eight toasted baguette slices for assembling tuna bruschetta. One of the best Copper Common menu items is also one of the simplest: chicken croquettes ($6). They come three per order, but I’m pretty sure I could eat a dozen. They’re a mixture of finely minced chicken blended with cremini mushrooms, a little seasoning and some milk and cream, rolled into torpedo shapes, breaded and deep fried. The result is crispy, ridiculously addictive bites of heaven. I have to say, though, that I prefer the croquettes to the actual fried chicken plate ($17), which consists of two pieces of boneless, breaded and fried chicken, on a bed of silky mashed potatoes. Kudos to the kitchen for using thigh meat rather than breast, yet the chicken was bland, lacking seasoning, and a corner of one of the chicken pieces was little undercooked and pink. I also don’t quite get the topping—a mélange of julienned jalapeño, red pepper and red onion. I’d call the fried chicken a bust, but the croquettes a must. During a recent visit, there was a special offered that I sure hope finds its way onto the regular Copper Common menu. It was a delicious spin on the traditional lobster roll, made with creamy shredded crab meat on buttery brioche and topped with snipped chives ($13). Equally dee-lish is the housemade ricotta ravioli bathed in a rich, meaty duck-neck ragu ($15). As you would expect from the folks who brought The Copper Onion to downtown Salt Lake City, the service at Copper Common is impeccable, the vibe relaxed and friendly, the beverage selection seductive, and the ambiance delightful. It’s bar food at its best.